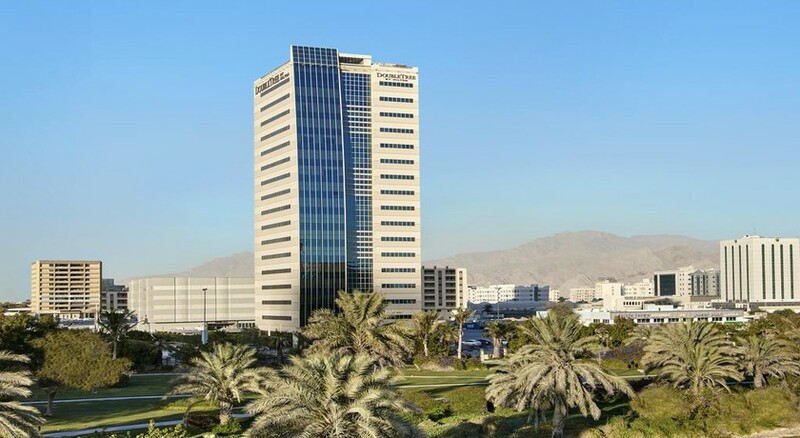 DoubleTree by Hilton, Ras Al Khaimah is a luxurious family-friendly hotel located in Al Nakheel Business District and offers warm hospitality with all modern amenities. world-class pools, swanky restaurants and lovely bars and all-inclusive plans this is a top favourite among family, couple and solo travellers. The hotel offers a large number of amenities to its guests, which includes elegantly decorated rooms, multi-lingual staff, 24/7 room service, fitness centre, luxury spa, lovely rooftop swimming pool, plush restaurants and swanky bars. With easy access to sister hotel DoubleTree by Hilton Resort & Spa Marjan Island via easy shuttle, the hotel is poised to offer you a complete city-break in the lap of luxury in Dubai. Known as 'The Rising Emirate', Ras Al Khaimah has emerged as a busy business and convention district and DoubleTree by Hilton is conveniently located in the city centre. The market are few minutes’ walk away and shopping malls, Towerlinks golf course and other entertainment venues are also in close proximity. The hotel is 15 minutes’ drive from the RAK airport and 75 minutes’ away from Dubai airport. The hotel also operates shuttles to all the prominent malls. DoubleTree by Hilton has 112 deluxe rooms and 42 elite suites elegantly furnished in modern decor. The Guestrooms include a variety of One King Bed Deluxe Room, One King Bed Deluxe Room Creek View, Two Twin Bed Deluxe Plus Creek View ands Two Twin Beds Deluxe Rooms, while suites include One King Bed Deluxe Suite with Living Room/Sofa and One King Bed Junior Suite with Large Sofa Bed. The air conditioned rooms come with a sitting area and sofa, en-suite bathroom, shower, bathroom slipper, bathrobe, hairdryer, iron and iron board, LCD TV with satellite connection, clock radio with MP3 connection, ergonomic desk and chair, mini bar, Wi-Fi internet connection and coffee/tea maker. Smokers may request smoking rooms beforehand. DoubleTree by Hilton Ras Al Khaimah has several eateries and bars that cater to the palate of its guests. Podium is where breakfast and dinner is served in a live-kitchen setup, while The Lobby Lounge and Cafe is a great meeting place that's open during evenings and serves hot beverages, too. There is also a stunning Treetop Bar where you can relax with delicious cocktails and live music. 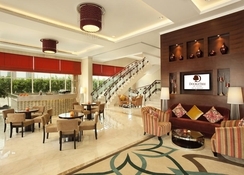 DoubleTree by Hilton Ras Al Khaimah has ample facilities for relaxation and recreation of its guests. Giant pools surrounded by gardens and equipped with sun loungers, parasols and recliners invite guests to soak in the water or sun. There is a spa with 24x7 services that has whirlpools, sauna, massage rooms, and other rejuvenating treatments. The kids can have fun at a Mini Club. Watersports facilities are available at sister hotel DoubleTree by Hilton Resort & Spa Marjan Island.